Only an hour from the Durango, CO airport or a four hour drive from Albuquerque, NM, you’ll find a scenic mountain getaway with a unique natural phenomenon – geothermal springs. 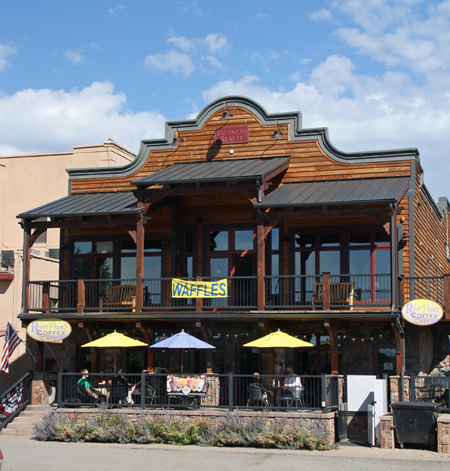 Pagosa Springs is one of those friendly mountain towns that attracts vacationers, many of whom ultimately become part-time or full-time residents. Pagosa Springs is small enough to retain the natural beauty and charm of a mountain village yet large enough to have some very nice spas and hotels. Much of the downtown area of Pagosa Springs is heated by geothermal hot springs which bubble up to the surface in several places. 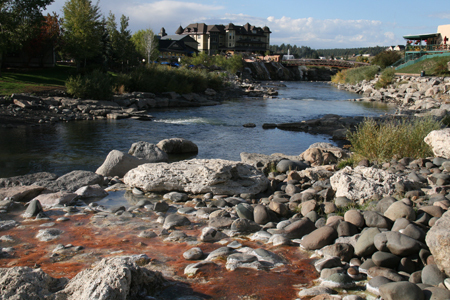 Home of the deepest geothermal hot spring in the world, Pagosa Springs is known for the mineral waters. You can actually see the “Mother Spring” which is located on the property of the Springs Resort. At 144 degrees, you have to keep your distance, but it’s fun to look into the blue waters of this amazing spring and read the history and Native American stories on plaques around the wall. You can see where the springs bubble up and flow into the San Juan River and marvel at the mineral formations you’ll encounter throughout the downtown and resort area. In the cool of the morning or during the winter, you’ll see steam from the springs filling the air. And, of course, you can take a dip in the springs at The Springs Resort, Healing Waters Resort or the Overlook Hot Springs Spa. Since Pagosa Springs is a mountain town, there are plenty of outdoor activities to keep you busy. In the winter, the Wolf Creek Ski area is a draw for visitors. The Pagosa Springs area has X-C ski trails, sledding, snowmobiling and snow play. Their online Winter Sports Guide will give you more ideas. In the summer, the San Juan River is alive with tubing, kayaking, and rafting. Even if you don’t get on the river, yourself, you can sit at riverside restaurants like Tequila’s and watch the activity as the river flows through downtown. Biking and hiking are great activities and there are trails in the area for both. There is a short paved path along the river downtown as well. Pagosa Springs is a draw for the outdoorsman (or outdoorswoman). There is fishing (the river is stocked with large trout), hunting and wildlife viewing. It is not unusual to see deer or elk in the area. When driving just outside town, I watched a huge skunk cross the road! For the family, you can enjoy wildlife in a more protected environment at the Rocky Mountain Wildlife Park. Be sure and go during one of the scheduled feedings. Pagosa Springs will keep you returning for their scheduled events ranging from music and art festivals to a balloon festival and a small-town 4th of July celebration. There is always something going on. The Visitor’s Center maintains a calendar of events. 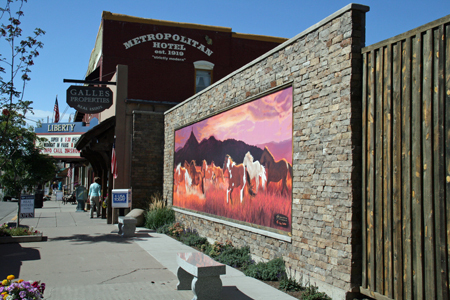 When you aren’t soaking in the mineral hot springs, you can walk the main streets of this quaint town and enjoy souvenir shops, clothing shops and art galleries. Restaurants range from Mexican food to coffee shops. All are casual and most are locally owned. 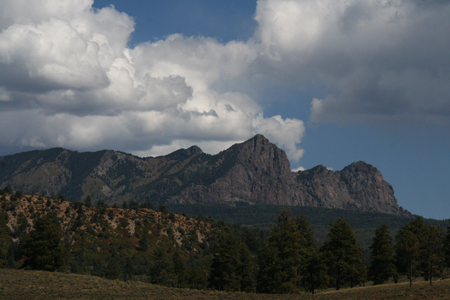 If Pagosa Springs doesn’t keep you busy enough, you can take some fantastic day or weekend trips. Less than an hour south is Chama, NM and the Cumbres & Toltec Scenic Railway, a narrow-gauge train which will take you through some spectacular mountain scenery. Built in 1880 and essentially unchanged since, the C&TSRR is the most outstanding and best known example of steam-era mountain railroading in North America. A short drive will take you to the Chimney Rock Archeological Area, Chimney Rock lies on 4,100 acres of San Juan National Forest land surrounded by the Southern Ute Indian Reservation. The site was home to the ancestors of the modern Pueblo Indians 1,000 years ago and is of great spiritual significance to these tribes. Their ancestors built over 200 homes and ceremonial buildings high above the valley floor, probably to be near the sacred twin rock pinnacles. You can see some of the excavated structures. If you are fascinated with the Native American history of the area, you can drive farther and visit the famous Mesa Verde National Park. The culture represented at Mesa Verde reflects more than 700 years of history. From approximately A.D. 600 through A.D. 1300 people lived and flourished in communities throughout the area, eventually building elaborate stone villages in the sheltered alcoves of the canyon walls. These are the well-known cliff dwellings. You’ll find places to stay in all price ranges. Most accommodations are in the downtown area and so you can walk to most everything. 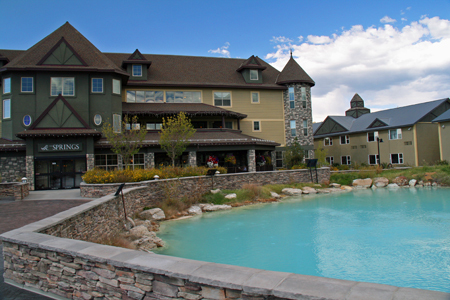 I enjoyed the Pagosa Springs Resort & Spa, probably the most upscale place to stay in town. They also are the ones with the terraced hot springs pools overlooking the river, which are a real draw. I highly recommend Pagosa Springs for an enjoyable weekend away or vacation. What I most enjoyed were the friendly people and the refreshing natural beauty. All the rest… the events, the spas and the outdoor adventures are just icing on the cake.